Yoko Ono and John Lennon collaborated on many albums, beginning in 1968 when Lennon was still a Beatle, with Unfinished Music No.1: Two Virgins, an album of experimental and difficult electronic music. Two less controversial, yet equally challenging and experimental albums were released in addition to Two Virgins; Unfinished Music No.2: Life with the Lions, and Wedding Album, both in 1969. Several of their later albums were released under the name The Plastic Ono Band, and often featured other musicians such as Eric Clapton, Klaus Voorman, and Alan White. The Plastic Ono Band's first album, Live Peace in Toronto 1969, was recorded during the Toronto Rock and Roll Revival Festival. The first half of their performance consisted of rock standards, and during the second half, Ono took the microphone and along with the band performed what may be one of the first expressions of the avant garde during a rock concert. The set ended with music that consisted mainly of feedback, while Ono screamed and sang. Their fifth album together, Some Time in New York City, released in 1972, is fiercely motivated by political issues the couple found themselves confronted with upon moving to New York City in September, 1971. The album was highly controversial but is generally seen as the beginning of Ono's emergence as a songwriter with "Sisters O Sisters", "Born In A Prison", and "We're All Water" With the birth of their son Sean in 1975, Lennon put his career on hold to raise the boy and rekindle his relationship with his older son Julian. In the summer of 1980, both Lennon and Ono felt ready to resume to work and began composing. They made the decision to release their impending songs together on the same album. Subtitled "A Heart Play", Double Fantasy would be a collection of songs whereby John and Yoko would be singing to each other. Released in 1984, Milk and Honey is notable for being Lennon's first posthumous release of music, having been recorded in the last months of his life during and following the sessions for Double Fantasy. Though Lennon's death caused a temporary shelving of the project, Ono was later capable of returning to complete it. Subscribe to John Lennon & Yoko Ono RSS Feed to get latest lyrics and news updates. 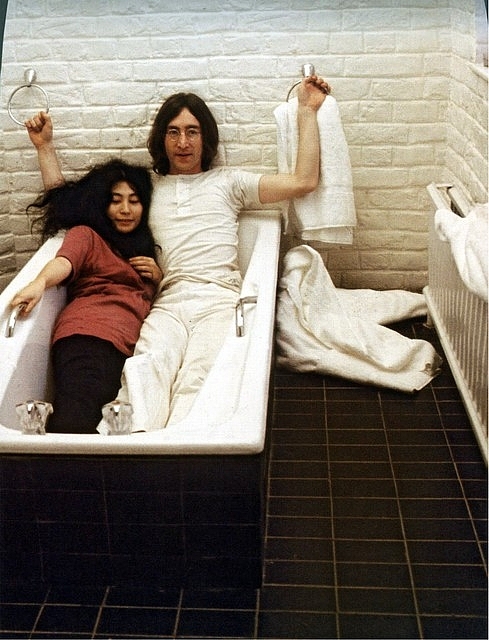 What do you think about John Lennon & Yoko Ono? Let us know in the comments below!